Positronic Releases Panther II – A Unique Connector Designed for Rugged Industrial Applications » HHP Associates, Inc.
Positronic has announced the release of its new Panther II connector. The Panther II is designed for rugged, high power applications where reliable electrical current is required for operating in harsh environments. Power connectors act as the vital link between a device and its source of power. Industrial machinery used for industries such as agriculture, construction, earth moving equipment and railways require a great deal of power and operate in harsh outdoor environments. These machines need to operate reliably and efficiently for many years. The Panther II is specifically designed to withstand harsh conditions and provide a consistent power connection. The connector is one of the few IP68 and IP69K rated products on the market, and withstands shock and vibration, high temperatures, exposure to sunlight and salt spray, and has excellent chemical resistance. The Panther II is a large, touch-safe cable-to-cable connector. It assembles quickly, and meets industry standard safety features for fire, smoke and toxicity. It also features a robust stainless steel locking mechanism for a multiplicity of mating cycles and the material is certified to a UV level of F1. 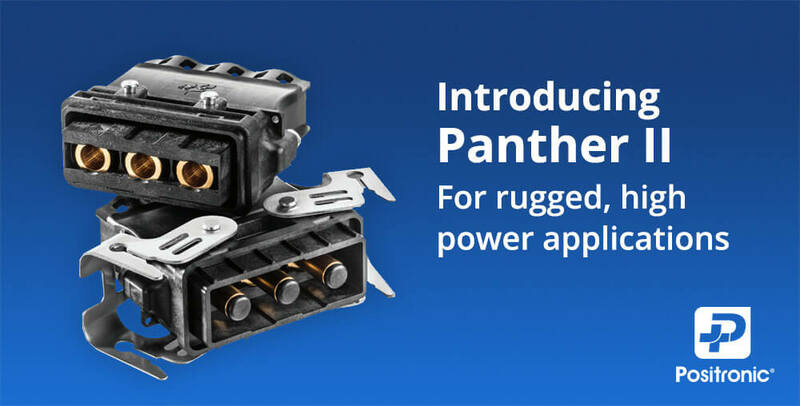 “The Panther II is engineered for high current and high efficiency and was designed to address the demanding requirements for rugged and reliable power solutions,” states Natesh Kannan, Global Product Manager at Positronic. The Panther II will be available for shipment in December 2018.